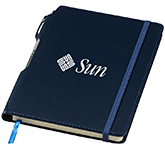 Attract new clients with eye-catching printed notebooks and pens! 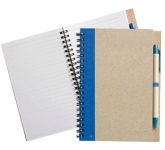 Office supplies and stationery are always desirable, no matter who you talk to. 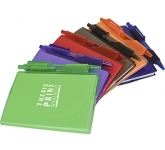 Whether you are trying to get on the good side of a hard-to-get client or just looking for ways to inspire your customers to buy more products, custom printed stationery is always a great choice when it comes to promotional items. But sometimes just giving away notebooks isn't enough. Sometimes you have to go one step further and include a pen. 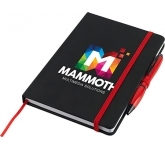 What's more, if you really want to boost brand exposure and widen your reach, you'll see the clear benefits of investing in promotional notebooks and pens. 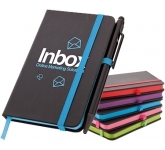 Yes, technology has evolved quite a bit in recent decades, which is why we usually use our gadgets to jot down ideas. But you can never go wrong with the old classics: paper and pens. 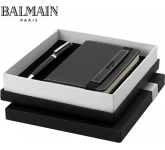 Thus, by investing in branded notebooks and pens, you'll not only get a chance for your business to blossom but also inspire others to go back to the old ways of remembering things. 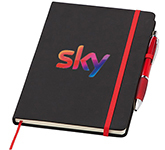 Our stylish branded notebooks and pens are manufactured from high-quality materials that are just a delight to hold and write on. 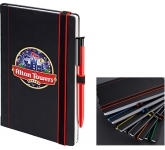 Furthermore, they are available in a huge variety of different colours and design options, thus making sure each business or organisation stays unique, no matter what. But what makes printed notebooks special, you may ask? Well, it's all in the convenience. 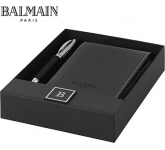 With these combo sets, you will get not only a notebook but a pen as well! Thus, your potential customers and clients will be all perfectly set for future brainstorming sessions. 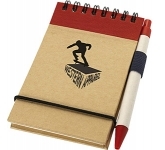 Moreover, they'll use their pens to write in their notebooks time and time again. 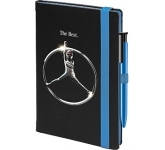 That's the key to their success, as it guarantees plenty of impressions every time they open their notebook! 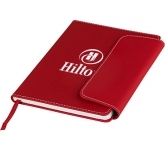 What's great about branded notebooks and pens is that you will not have to go over your desired marketing budget. In fact, their price is suitable even for those on the tightest of budgets! There are plenty of options to choose from also, so every business can find a great combo set for their particular marketing or advertising campaign. Furthermore, since their price is relatively low, but the rate of impressions is high, you can bet that you'll get an incredible return on investment. 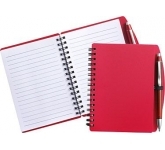 Your business will see a surge in potential clients, no matter where you give these items away. 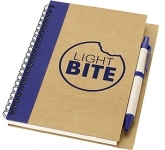 Promotional events, product releases, trade shows, exhibitions, conferences and even schools and universities - printed notebooks and pens are always the "write" option! 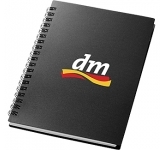 We offer a wide variety of notebook printing options on our vast range of notebooks and pens from screen printing, debossing, embossing, UV varnish, right through to the very latest in UltraHD dye sublimation photo print technology allowing us to reproduce full colour images and logos to a standard most suppliers can only dream of. 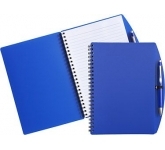 This means you will always receive a truly professional finish on any notebook and pens we supply. 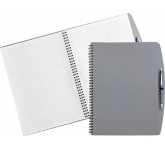 So, if you are looking for low cost, budget, value or cheap printed notebooks and pens, and happen to find the same branded notebooks cheaper, with the same print specification and turnaround, just let us know and we will match the price and back it with our industry Award Winning Customer Service - that's our guarantee!! 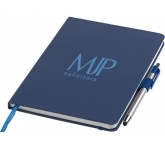 For additional information on choosing the right kind of notebooks and pens or how to use promotional products in your marketing and advertising efforts, why not contact us and have a chat to one of our friendly dedicated account managers who will be happy to advise you further.